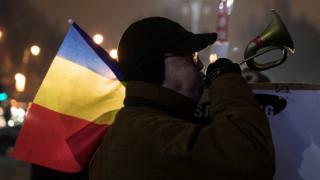 The Romanian government has survived a no-confidence vote, called after mass protests forced it to scrap a decree that would have weakened anti-corruption measures. Lawmakers from the three-party ruling coalition abstained, denying opponents the 50% support needed to pass the vote. More protests are planned this weekend. The decree has been scrapped, but protesters say the government has proved itself untrustworthy. They also fear that new legislation, promised by the prime minister when he abolished the decree, might contain some of the same elements in a different form. Was government U-turn strategic retreat or surrender? The decree would have decriminalised abuse of power offences where sums of less than €44,000 (£38,000; $47,500) were involved. That was seen by many as an attempt by the government to let off many of its own officials caught in an anti-corruption drive. The government had argued that the changes were needed to reduce prison overcrowding and align certain laws with the constitution. On Tuesday, President Klaus Iohannis accused the ruling Social Democratic Party (PSD) of plunging the country into crisis with its "strange kamikaze strategy" only two months after convincingly winning national elections. Mr Iohannis, who is a member of the opposition centre-right National Liberal Party, told a joint session of parliament that it was too early to hold snap elections. But he called on the government to come up with solutions. Social Democratic legislators staged a walk-out. The Constitutional Court is due to rule this week on whether decree number 13, the legal measure which provoked mass demonstrations, broke the constitution or not. The decree has already been revoked, but the court's ruling too will affect what the government does next, says the BBC's Nick Thorpe in Bucharest. The issue has sparked Romania's largest protests since communism fell in 1989.